One of the most important things you can do as you age is to stay active. Exercise strengthens the body and decreases the risk of falls for seniors. My senior neighbor stays active by walking her dog, attending water aerobics and pole walking. As my neighbor told me about pole walking and how much she enjoyed it, I became interested in learning more. Pole walking or Nordic Walking is fitness walking with specifically designed Nordic Walking Poles. It is a very effective cardiovascular workout that works all the major muscle groups of the body. According to the American Nordic Walking Association (ANWA), walking with poles increases oxygen consumption, burns more calories, and is 46% more efficient than walking without poles. While Nordic Walking is a fitness exercise that all ages can participate in, it is a growing trend among the Senior population. In addition to the total body workout that Pole Walking provides, it can greatly benefit seniors with joint pain, specifically knee and hip. The poles provide support and helps transfer weight off painful joints significantly lessening discomfort or eliminating it all together. 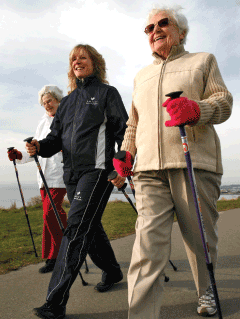 If you are looking for ways to stay active maybe Nordic Walking is the exercise for you. Contact local senior centers and gyms for classes and groups near you.